This year’s Falcon FledgeWatch has been scheduled for Tues, June 17th. We will use a remote electric trigger to open the pen door sometime between 9 and 10 a.m. As in past years, DGIF personnel and volunteers will monitor the birds from numerous vantage points in downtown Richmond to ensure that their first day on the wing goes well and without incident. A second day of monitoring may take place on Wed, June 18th. As late as last week the two chicks still retained visible traces of down on their head, wings and body. Little to no down currently remains, and the birds are in their full handsome brown and buff juvenile plumage. 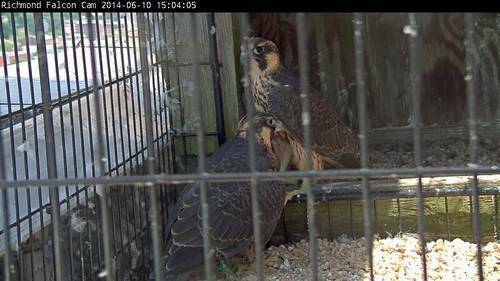 Falcon Cam observers may see them vigorously exercising their wings in preparation for their first flight.